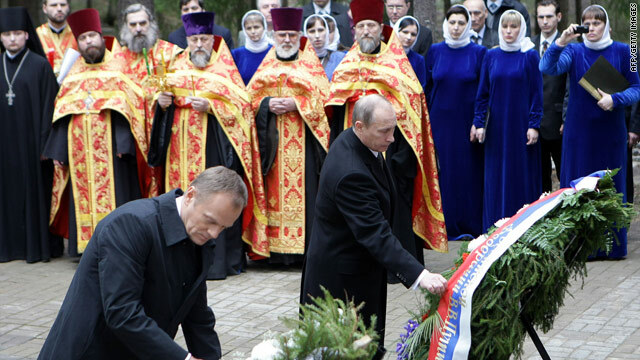 Russian PM Vladimir Putin and Polish PM Donald Tusk lay tributes at the memorial museum to the Katyn massacre, April 7, 2010. A declaration says the "massacre was committed on the direct orders of Stalin"
(CNN) -- Russia's lower house of parliament has approved a resolution recognizing that Josef Stalin's regime was responsible for the 1940 massacre of more than 20,000 Polish officers, signaling a thawing of relations between Poland and Russia, state media reported. In a written statement, Poland's Foreign Ministry said it welcomed the resolution titled "Katyn Tragedy and Its Victims," adopted by the State Duma of the Russian Federation on Saturday. "Acknowledging the Stalinist totalitarian regime's accountability for this unprecedented massacre is the Russian Parliament's important gesture, signifying that we are making progress on the way to reconciliation between our countries and peoples," said the statement. "This gesture proves that there is no turning back from the truth-based dialogue between Poland and Russia," the statement said. Documents that had been stored in secret archives for years show that the "massacre was committed on the direct orders of Stalin," a draft of the declaration says, according to the state-run RIA Novosti news agency. The masterminding of the Katyn Massacre has been a lingering, contentious issue between the two former communist nations. The World War II massacre, in which an estimated 20,000 Polish officers were murdered at point blank in the village of Katyn, has tainted Russian-Polish relations. The Duma's Friday vote comes as Russian President Dmitry Medvedev prepares to travel to Poland in December. For decades, the Soviet government blamed the killings on Nazi Germany. In 1990, Russia finally admitted to what many in Poland had long suspected: The Soviet Union secretly murdered as many as 22,000 Polish soldiers and civilians in the early days of World War II in an attempt to pre-emptively suppress a Polish rebellion against communist rule. That year, Russian prosecutors also launched a criminal case into the killings, but that case was closed in 2004. Since then, the country has handed over some investigation files to Polish officials. This year, a 2007 film about the massacre aired on Russian television for the first time. But some Russian lawmakers say the issue is still in dispute. Communists, who opposed the declaration, claim German authorities actually executed the Polish soldiers. The party's leader has dubbed attempts to blame Stalin part of "Soviet history falsification" as part of an "ideological war," RIA Novosti reported. Former Polish President Lech Kaczynski was killed in a plane crash earlier this year when he was headed to a memorial at the massacre site. Kaczynski, 60, had been traveling with a Polish delegation to Russia to commemorate the massacre's 70th anniversary. His wife and several top military officials were also killed in the crash.